To help enhance Pennsylvania’s economy by helping job creators, the House this week passed a multi-bill package to cut government red tape and reduce burdensome regulations while still maintaining the integrity of health and safety regulations. Among the bills are those that would review statutes and regulations for possible revision or repeal; enhance the review process for regulations that impose a major cost burden on the state; grant the General Assembly the authority to repeal any regulation in effect without the governor’s consent; reform the permit process; and require each state agency to designate a regulatory compliance officer. Pennsylvania currently has more than 153,000 regulatory restrictions that stretch across every industry operating within the Commonwealth. These restrictions create hurdles that businesses of all shapes and sizes must jump over in order to create jobs in Pennsylvania. The World Bank and the Mercatus Center at George Mason University estimate that over-regulation has a negative effect on economic growth, ranging between 0.8 percent and 2.3 percent. The bills would not require the repeal of any regulations vital to the health and safety of the Commonwealth’s citizens. The package now moves to the state Senate for consideration. As a way to help senior citizens and others who take monthly maintenance medications, the House this week passed legislation that would allow customers to synchronize the refilling of their prescription drug medications. House Bill 1800 would make filling prescriptions more convenient, as it would eliminate multiple visits to the pharmacy by allowing all prescriptions to be filled on the same day each month. Different refill dates throughout the month can make it difficult, especially for those who use public transportation, to pick up their medicine. Studies have shown that when medications are not synchronized, a reduction in taking medications as prescribed occurs. Currently, consumers can request this synchronization, but this bill simply puts the practice into state law and prohibits an insurance company from denying coverage for a partial fill of a script in order to facilitate medication synchronization. Thirty-five other states have enacted or introduced similar legislation. To help job creators fill in-demand jobs now and in the future, the House overwhelmingly approved a nine-bill bipartisan package to improve career and technical education opportunities and enhance science, technology, engineering and math (STEM) curriculum. The bills – which are designed highlight the benefits of this educational option for students looking to enter the workforce -- now move to the state Senate for consideration. With May designated as Lyme Disease Awareness Month in Pennsylvania, individuals who spend time outdoors should check themselves for ticks and be aware of the symptoms of Lyme disease and other tick-related ailments. In an effort to address this issue, Department of Health recently launched “Don’t Let a Tick Make You Sick,” a campaign aimed at raising Lyme-disease awareness. For tips about how to protect yourself from Lyme disease, click here. 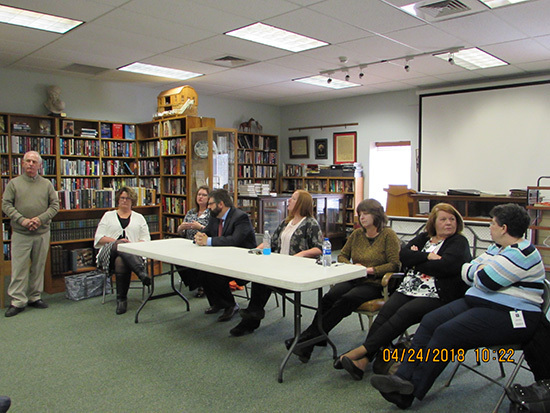 I recently held an Elder Caregiver Support Forum at the Northern Columbia Community Center in Benton. Attendees gained valuable knowledge on a variety of topics during the informational sessions. Pictured with me (from left) are Heidi Young, elder care coordinator from the Law Office of Kreisher and Gregorowicz; Wendy Rishel, Life Geisinger; Nicholas Lutz, Lutz and Petty Law Office; Bridget Kingston, veterans affairs director; Kathy Kelleher, Geisinger Home Health and Hospice; Lynn Rosbach, Columbia-Montour Aging Office; and Sandy Darlington, Columbia-Montour Aging Office. 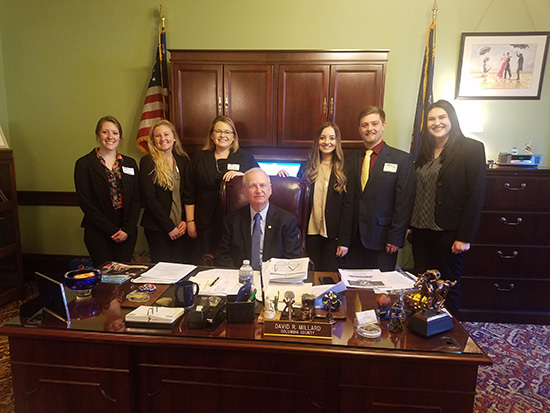 It was my pleasure to chat with these Bloomsburg University of Pennsylvania nursing students who visited the Capitol on Monday. Pictured with me are Jessica Kacyon, Nicole Murdock, Alaina Gordner, Valerie Scheels, Colton Unger and Krista Romig. Seventh-grade students at St. Columba School in Bloomsburg were chosen to present their project, “Multimedia lnteractive Power Point Challenge” at the PAECT Student Showcase in the East Wing Rotunda of the Capitol Building in Harrisburg. The students created the fun, illustrated Jeopardy-style quizzes themselves and I enjoyed the opportunity to participate in the challenge. 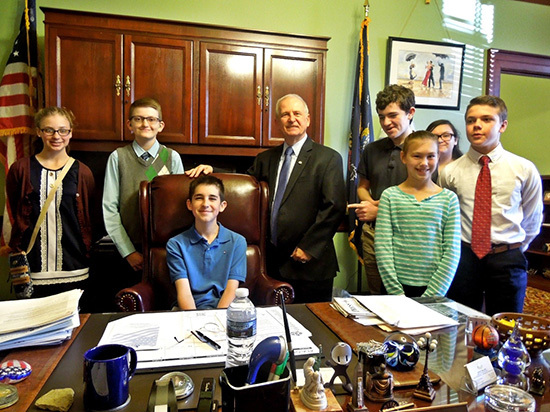 Pictured with me are Alexis Turayev, Matthew Getz, Reed Keck, Alina Shannon, Damyan Petryshak, Morgan Pierce and John Guerriero. May is Motorcycle Safety Awareness Month and riders of all experience levels are encouraged to learn about motorcycle safety by attending a motorcycle safety course offered free to Pennsylvanians. This year a new contractor, Total Control Training Incorporated, has taken over the PA Motorcycle Safety Program and is offering some exciting changes, including more opportunities to ride on PennDOT’s SKIDBIKE and a new course for those would-be riders who are not sure if they want to ride. The “Introduction to Riding Clinic” is a four-hour, non-licensing clinic that teaches fundamental skills both in the classroom and on the course. Students are provided with a motorcycle and helmet for the class. Previous courses have been revamped and include the Beginning Rider Clinic (BRC), the Intermediate Riding Clinic (IRC), the Advanced Rider Clinic (ARC) and the 3-Wheel Riding Clinic (3WRC). For more information or to enroll in a clinic, visit www.pamsp.com or call 1-800-845-9533. Courses have begun for the year and run through October. All motorists are urged to be on the lookout for motorcycles while traveling, increase your following distance when behind a motorcycle and allow a motorcyclist the full width of the lane. • The Bloomsburg Fire Department Carnival will be held through Saturday, May 5.